The Bridal Boutique is just that…a boutique. Located in one of the hippest neighborhoods in town, we provide a more intimate setting…no huge warehouse feel, no “corporate” mentality. Just fun and relaxing! Make an appointment today! I was SO happy that I had Jessie helping me out, today! She made me feel so comfortable and beautiful! She picked out my dress to try on and I fell in LOVE! I said yes to my dress and i couldn’t have done it without her! Thank you so much, Jessie! I had a great experience with Sarah yesterday at bridal boutique! Very calm and relaxing environment. Loved the selection of dresses and cant wait to wear my dress! My friends and I had the best time finding my wedding dress at Bridal Boutique. Sara was wonderful to work with. She was very patient and knowledgeable and ended up picking my dress! She was super nice and wasn’t pushy at all when it came to which dresses I wanted to try on and deciding on “the one”. Sara was also very accommodating when we wanted to come back the same day. I would recommend Bridal Boutique to anyone! I have been to Bridal Boutique on multiple occasions, and have always had a great experience. This past weekend I went to get my wedding dress. Sara was a pleasure to work with - she wasn't pushy at all, but knew when to let us admire the dress and when to move on to the next one so that we could see as many as possible in our appointment. 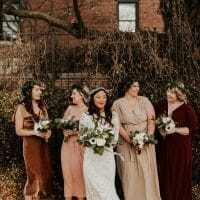 I ended up finding my perfect dress there, partly because I knew I could trust Bridal Boutique to order the correct size and color and connect me to a great seamstress. I will definitely go back to get bridesmaid and mother of the bride dresses, and would highly recommend this shop for anyone wanting a personalized and professional experience. Like us on our FaceBook page to stay up to date on the newest styles from our collections, details about upcoming events, and to learn about current promotions.